Samsung might have skipped on smartphone announcements at this year's MWC, but that doesn't mean the Korean giant didn't take the event seriously. On the contrary, the Barcelona venue saw a total of three tablet announcements, all clearly geared towards a more serious, productivity-oriented crowd. Sure, you could argue that the 10-bit HDR panel and 4-speaker AKG setup on the Tab S3 shout multimedia loud and clear. 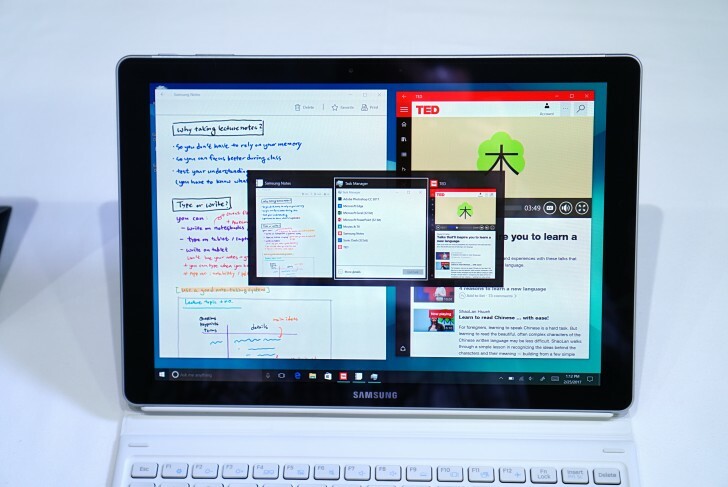 However, beyond that, Samsung's new lineup is all business, especially its two new Windows-based 2-in-1 offers. 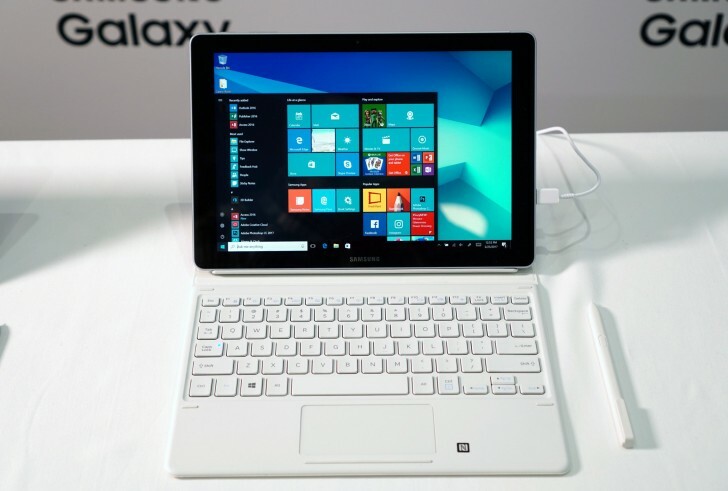 The Galaxy Book 10.6 and Galaxy Book 12 both run Windows 10 on standard PC X86 hardware and employ a 2-in-1 factor. 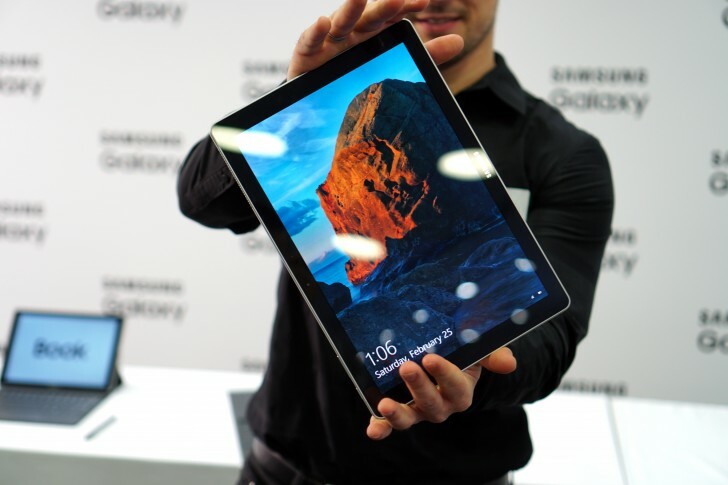 This, as well as the general design, Super AMOLED panels and a few other specs and accessories, make the pair quite similar to the Galaxy Tab S3. However, unlike their Android sibling, these come with both an S Pen and a slightly different keyboard accessory out-of-the-box. Combined with the Windows environment, this does make for solid 2-in-1 offers. We did get to spend some time with both units, and we are happy to report they mostly share the slick, all-business design of the Tab S3. The glass back is gone, which means fewer fingerprints to worry about. This also means an all-metal unibody chassis and rounded corners. The units on the show floor all came with a silver finish, but black might be an option as well. In any case, the construction is durable and blends in seamlessly into pretty much any environment, business or otherwise. At around 650 grams for the 10.6-inch model and 750 grams for the 12-inch one, both Galaxy Book variants are pretty light. Carrying them around should be a breeze - a big motivation to potentially lure in traditional laptop users. 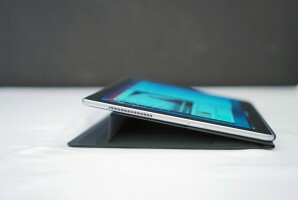 Besides the obvious change in materials and size, there are a few other details that set the Galaxy Books' metal bodies apart from the Tab S3. For one, the camera on the back is now centered horizontally, instead of vertically, since Samsung doesn't really expect you to use the Galaxy Book in portrait mode. The front of both units is even cleaner. This is mostly due to the lack of a home button and the typical pair of capacitive controls. These aren't necessary for a Windows 10 environment. Also, the four-speaker AKG setup was dropped, replaced with a simpler stereo one. This means only two speaker grills - one on the top and one on the bottom. The bigger 12-inch model has an extra grille on the top side as well, but that is just a cooling exhaust for the fan. 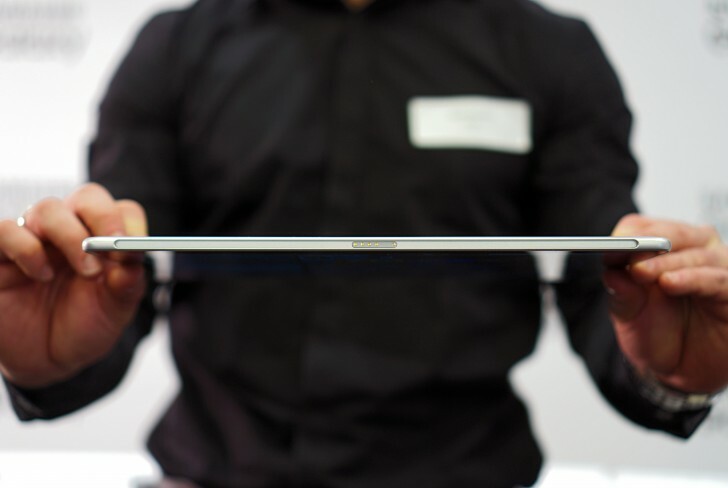 The 10.6-inch tab doesn't need it thanks to its Core m3, which can be passively cooled. Speaking of the top bezel, you get a power button, a volume rocker, plus a pair of microphones. 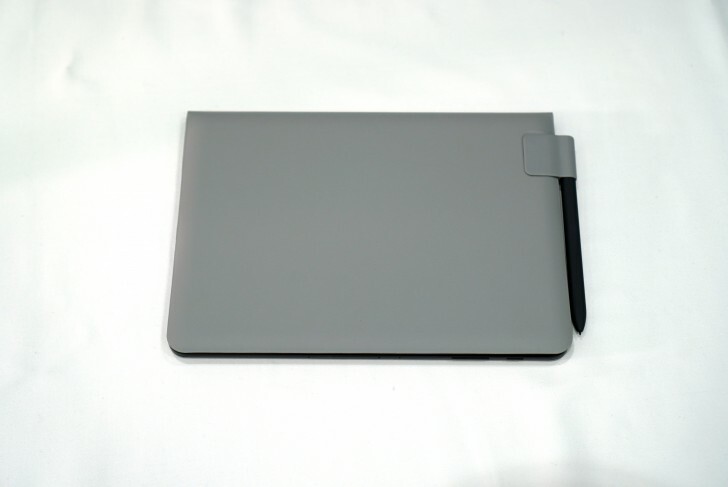 As expected, the bottom side is occupied by the keyboard attachment mechanism. Just like the Tab S3, it relies on pogo pins for communication. Interestingly enough, there are five pins, instead of six, this time around. The mechanism itself still relies on magnets. But there is also a bigger attachment groove than on the Tab S3. This is likely in place to account for the extra weight and screen real estate. We have to say, once attached, the whole setup feels really sturdy. While on the topic of keyboard, it checks most boxes when it comes to two in ones, at least in our book. We appreciate that Samsung includes it in the box, along with the S Pen, rather than selling it separately, like with the Tab S3. 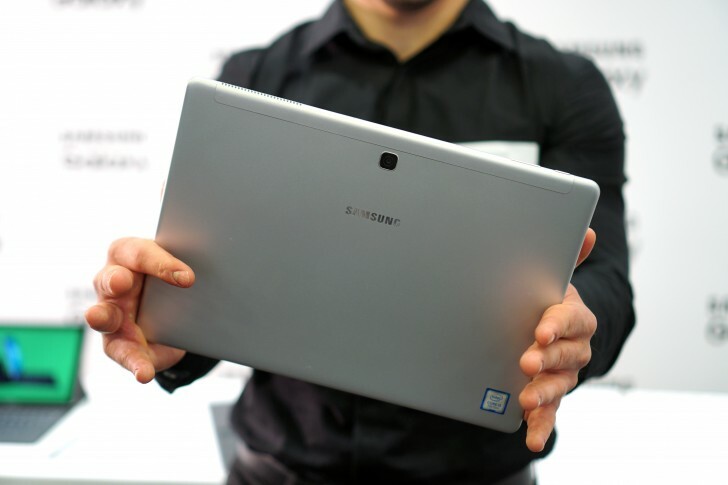 First, to clear up the obvious points - yes, the keyboard draws power from the tablet. It is also conveniently backlit and comes in white or black. The keyboard also doubles as a case. Naturally, this entails some size difference between the 10.6-inch and 12-inch variants. Samsung has used this to simply scale up the buttons themselves accordingly. The 12-inch one is a bit easier to type on. But things aren't all that bad on the 10.6 model either. The keys are nicely rounded, with decent travel and a good tactile feedback. 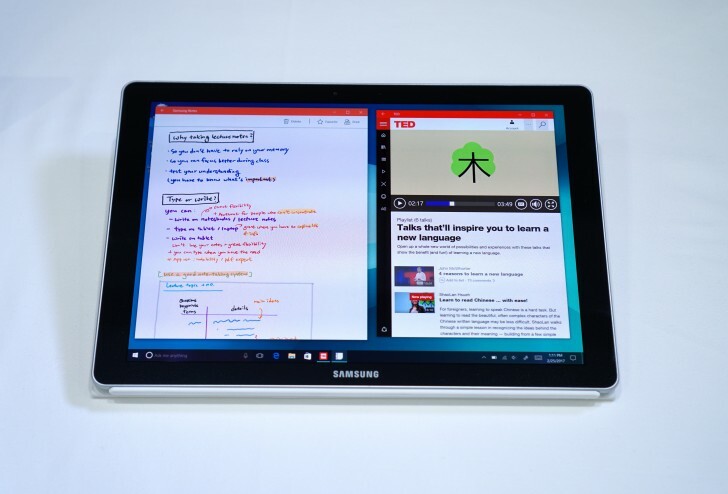 We see an improvement over the older Samsung TabPro S Windows convertible device. The touchpad is a great extra feature that the two Galaxy Book models have over the Tab S3. Granted, it is a lot more essential on Windows, as touch and even the S Pen often seem clunky for some tasks. 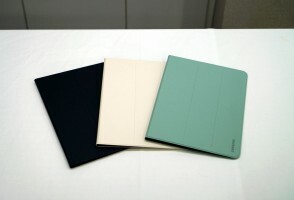 The touchpad surface feels great and offers plenty of glide. There are no dedicated mouse buttons, though. The scaling factor is applied hire as well - on the smaller unit the pad measures 77 x 43mm, while on the bigger it is 100 x 53mm. We have to say, the difference is noticeable. Another nifty aspect of the keyboard is the adjustable display angle. When we say adjustable, we mean there are something like three distinct modes. Two of them have the keyboard in its normal position and the display at one of two angles. 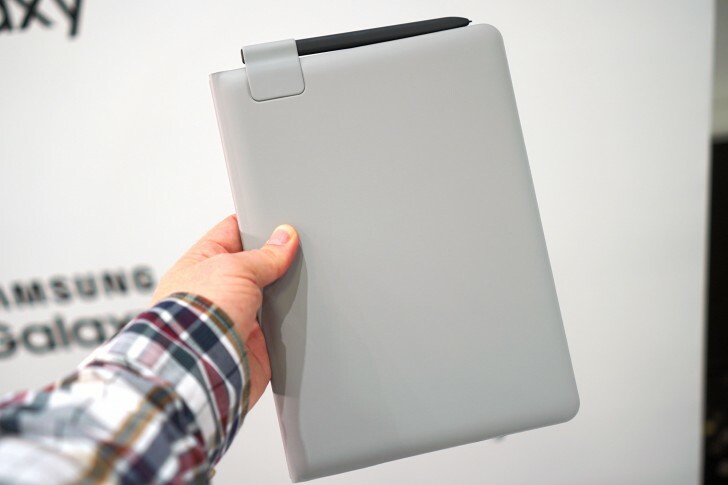 The third one folds the keys away and provides a slight tilt for using the touchscreen or S Pen accessory more conveniently. Moving on to said S Pen, it is identical to the one bundled with the Tab S3. 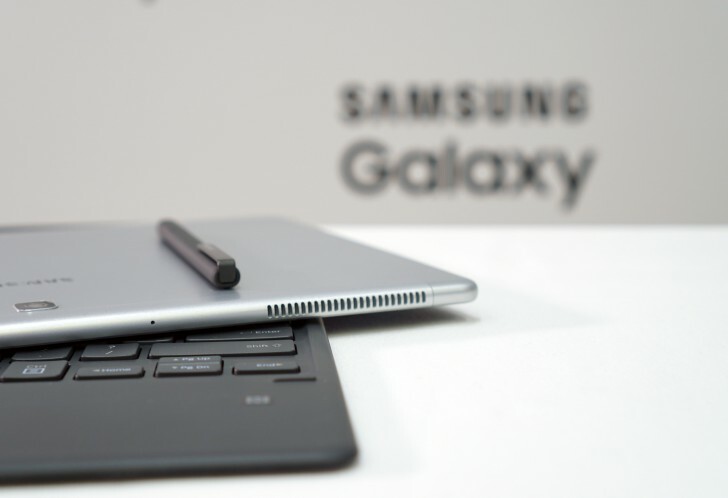 Since Samsung has maintained backwards compatibility for the signature tech, this means you can practically use any S Pen on the Galaxy Book, including those from older phablets, like the Note 4 and still get the full functionality. The stylus is still passive and it has a single button for accessing on-screen controls. Hovering is supported as well. As for the design of this new S Pen iteration, it is now a lot bigger and longer. Since it doesn't have to fit inside the tablets, Samsung apparently decided to go for something closer to a real pen. This makes the new S Pen a lot easier to handle and more precise. Its thinner 0.7mm tip helps in this respect as well. Using it for longer periods at a time is more convenient now and we do appreciate the extra grip from the soft-touch finish. Making the S Pen bigger did, however, create somewhat of a logistics issue - not losing it. Samsung has mostly solved this with a lanyard on the keyboard. Last, but not least, we will also mention that unlike the Tab S3 variant, the two Galaxy Book keyboards offer NFC as an additional feature. The chip is placed to the right of the touchpad and is primarily intended for easy connection with a smartphone to enable the Samsung Flow feature. But more on that in the next section. Besides screen size, there are a few other notable differences between the 10.6-inch and 12-inch Galaxy book models, both in terms of hardware specs and I/O. In the PC realm, where advanced performance and productivity are expected, these are arguably a bit more important points than on Android. 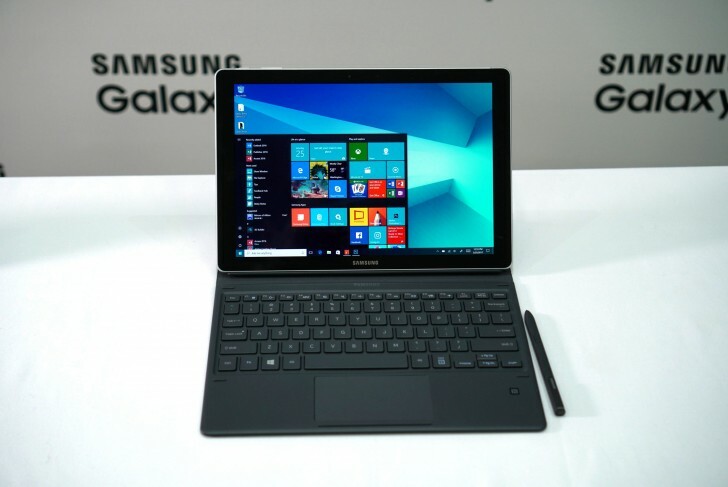 Starting off with the display, the one on the Galaxy Book 12 is not only bigger at 12 inches, but also sharper, with a resolution of 2,160x1,440 pixels. Plus, it uses Samsung's own coveted Super AMOLED technology, for exceptional contrast and color reproduction. Speaking of which, the bigger Galaxy Book even offers 10-bit HDR support, just like the Tab S3. With the right content content, this makes for an amazing multimedia experience, with better color reproduction, shadows and highlights. The smaller Galaxy Book 10.6 has an LCD panel instead, with no HDR support and lower resolution. Specs-wise, there is a major difference between the two tablets as well. 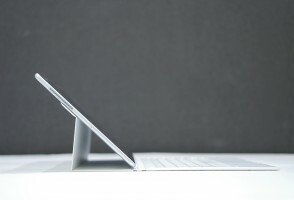 While on the surface, the Core m3 does look only slightly slower, with the same number of physical cores and a small drop in frequency, in reality, the performance gap is huge. The m3 will hold up pretty well with word processing, browsing even some light multimedia workloads. 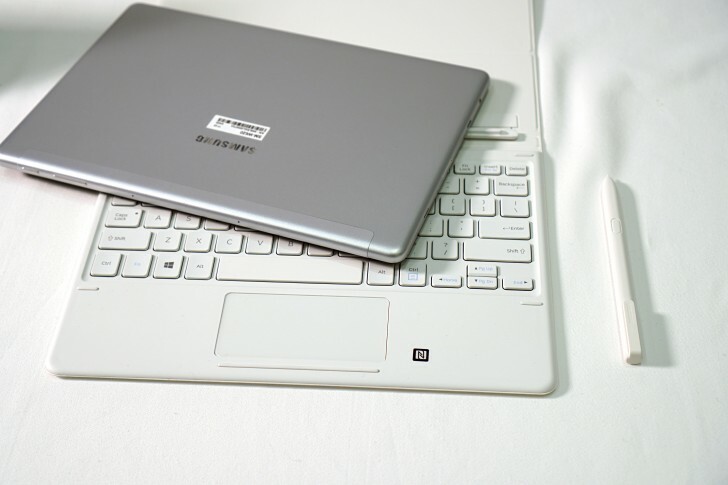 However, for anything beyond that you really need something beefier, like the Core i5 in the Galaxy Book 12. However, the clear bonus you get from opting for the lower-tier model is portability. It's a somewhat difficult trade-off since it comes at the cost of battery life - the smaller unit is equipped with a smaller 30.4W battery, instead of a 39W one. Combined with the less efficient LCD panel, this equates to around 10 hours of use, by Samsung's estimates. Pretty close to the 10.5 hours on the bigger model. Both units also offer fast charging - around 2.15 hours for a full charge. Other than that, you do get an additional USB 3.1 Type-C port on the Galaxy Book 12. This could help avoid at least a few carry-on dongles. 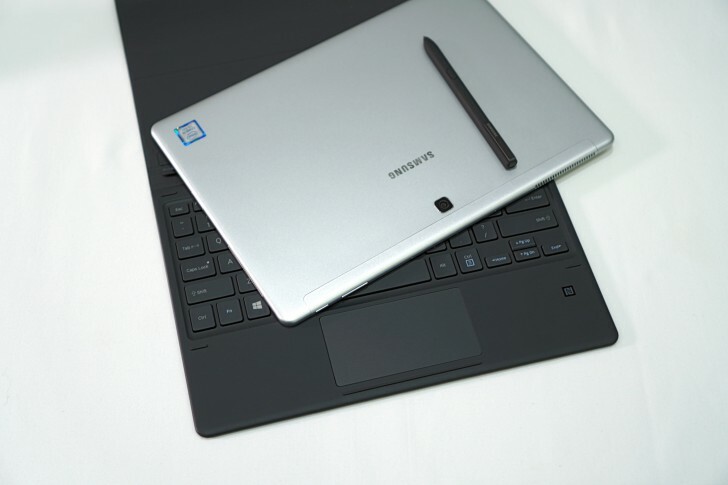 There are a couple of software tricks Samsung has included on its Galaxy Book devices as well. Remember that NFC sensor on the keyboard? Its primary purpose is to power the Samsung Flow experience. The platform saw its debut on the older TabPro S model and is now advancing towards a wider release. It allows for an easy sync between a recent Samsung Galaxy handset and the tablet for convenient data connection and notification sharing. It can also leverage your phone's fingerprint reader to unlock Windows 10. Another neat little addition to the Windows 10 experience has to do with the S Pen. Samsung now offers support for tilt detection in the Microsoft environment, which has been a thing on Android for a while now. This opens the possibility for more precise pen input. 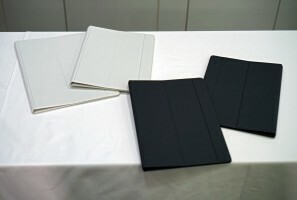 All things considered, we can't really point out any particular flaw in the new pair of Samsung Galaxy Books. For what they are, they do seem to offer a pretty compelling package. But that's just the thing, we can't really put out finger on the definitive concept and purpose of these units. That, however, is a much broader problem that lies withing the ever-morphing convertible or 2-in-1 market. If priced correctly, we can definitely see the Galaxy Books sway some on-the-go workers away from traditional laptop machines. Keeping that in mind, if you have already managed to convince yourself into making the switch, then you definitely want to give these Samsung options some thought. Yeah the 12" model has an SSD. The 10.6" uses eMMC v5.1 I believe.